The award for the best engineering education research paper and presentation at the Frontiers in Education conference in Washington, D.C. went to a team of ASU faculty members. The paper’s lead author and presenter was Glenda Stump, a post doctoral associate in ASU’s School of Social and Family Dynamics. 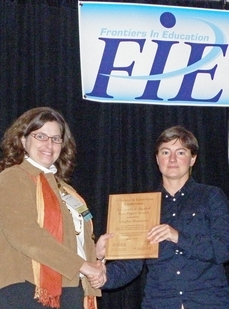 One of her co-authors, associate professor Jenefer Husman (left), is pictured accepting the award. For a second straight year, a top award at a leading national engineering education conference has gone to Arizona State University faculty members and researchers. The Benjamin J. Dasher Award recognizes the best research paper/presentation at the Frontiers in Education Conference, an annual gathering organized by the Education Society and the Computer Society of the Institute of Electrical and Electronic Engineers (IEEE) and the Education Research and Methods Division of the American Society for Engineering Education (ASEE). At this year’s conference, the Dasher Award went to presentation of a research paper authored by post doctoral associate Glenda Stump and associate professor Jenefer Husman in the School of Social and Family Dynamics, part of ASU’s College of Liberal Arts and Sciences, along with Wen-Ting Chung, a graduate student in ASU’s Mary Lou Fulton Teachers College and Aaron Done, an undergraduate participating in the Research Experiences for Undergraduates, a National Science Foundation program. Last year the award went to a paper presented at the conference by Stephen Krause, a professor in the School for Engineering of Matter, Transport and Energy, one of ASU’s Ira A. Fulton Schools of Engineering. Krause’s co-authors are College of Liberal Arts and Sciences faculty Robert Culbertson, associate professor in the Department of Physics and Astronomy, and professor Marilyn Carlson and associate professor Michael Oehrtman, both in the Department of Mathematics and Statistics. The paper by Stump and Husman’s team examined students’ beliefs about the nature of intelligence and the impact those beliefs had on their learning behaviors. The team found that differences in students’ approaches to learning can be determined to a large extent by whether they believe one’s level of intelligence is a fixed state or that one’s intelligence can be increased with effort. The results of the research, she says, can give educators a better understanding of the diverse ways people learn and help teachers be more effective in motivating students. 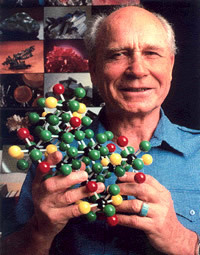 The research was supported by the National Science Foundation through a Career Award received by Husman in 2006. Career Awards recognize scientists and engineers seen as emerging leaders in their fields of research and teaching. Krause’s project was also supported by the NSF as part of its Project Pathways: Opening Routes to Math and Science Success for All Students. 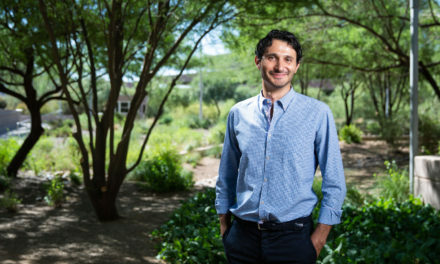 The goals of his team’s research involved devising programs to help high school teachers in four Phoenix school districts to more effectively integrate math and science concepts into their classroom lessons. 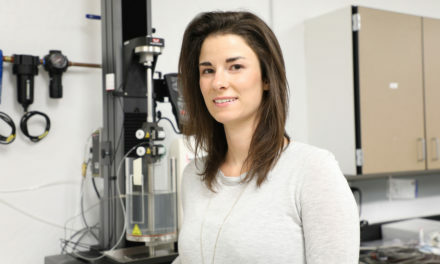 The project is providing teachers more effective ways to demonstrate to young students how knowledge of chemistry, biology, geology, physics, engineering and related subjects are critical to real-world endeavors.